Traveling With Kids: Off topic for a good cause: help my friend go bald! Off topic for a good cause: help my friend go bald! Every now and then I do take a brief moment on this blog to go off-topic, and today is such a day. My friend Julie is going bald in order to raise money for cancer research, and she's doing it for the second time around. She is a fantastic, funny and feisty friend, mom, and all-around great person. She also looks great bald. 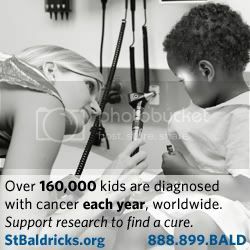 Julie is taking part in a fundraiser organized by the St. Baldrick's Foundation. You can find all the details about the foundation, their events, and how to donate here. It's a great event, and a great cause. I am way too chicken to give up my own hair, but I can support Julie getting her head shaved!